Rob Ford Ill While Doug Ford Takes Over Mayoral Race: Does Toronto Lose Out? 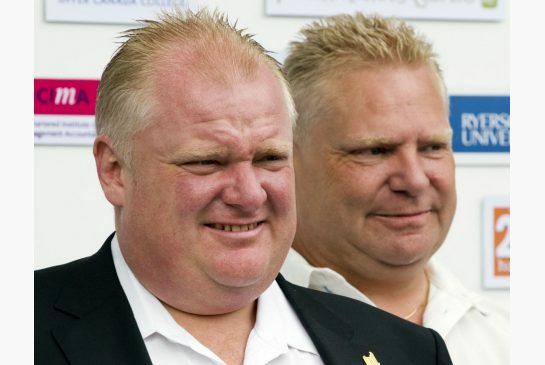 Rob and Doug Ford. Toronto City Council’s “Bad Boys”. The Toronto Mayoral Race is in full gear though, Toronto Mayor, Rob Ford has dropped out of the running for the Mayoral position due to his declining health issues. Ford was admitted to hospital last week with severe abdominal pain in the lower left quadrant. Tests showed a large tumor in Ford’s abdomen. After several tests at Toronto’s Humber River Regional River’s Church Street site, Ford was transferred mid-last week to Mt. Sinai Hospital in Downtown Toronto for more intensive care and further testings not possible to be done at HRRH. Mt. Sinai has done extensive testing on Ford, including an MRI, biopsy of the tumor, lung biopsy while Ford is reportedly in pain, nauseous and vomiting. Results of the tumor biopsy are reported to be available sometime Wednesday or Thursday of this week and further information will be made available to the public when or if it is deemed by Ford and his family to be appropriate to be released. Celebrities have been publicly announcing their well-wishes for the controversial but, “likeable” mayor. Jimmy Kimmel sent his regards and made an aired statement of best wishes for Ford. Meanwhile, Ford’s bid for the Mayoral Seat in the upcoming October 27th elections was dropped in a last minute deadline last Thursday before 2 p.m.. This was the election deadline for candidates to officially either drop out of the race or, enter it. In a twist of events, not surprisingly, Ford’s brother, Councillor Doug Ford, dropped Rob’s name from the Mayoral Race ballot and entered himself in his brother’s place. Doug then, entered Rob’s name in the running as councilor for Ward 2, Doug’s current riding and pushed nephew Michael Ford out of the councilor’s race for that ward. Michael Ford is now set to run as School Board Trustee in another ward. Doug Ford was not running for the upcoming elections. It was said that Doug had wanted out of politics to work in the business sector. He stated in a news conference last Thursday night that it was Rob’s wishes that he run for mayor in his place and Doug followed his brother’s wishes. While heart-wrenching to see a family in such pain, a mayor who has caused the city a lot of embarrassment world-wide with lies, illegal and distasteful actions, aided by his brother, Doug with cover-ups, everyone hopes that Ford will come through this and get well. Most hope the Ford Family will stay by the ailing mayor’s side and help him get through this horrific time and to come through this with flying colors. What is disturbing for Toronto residents are several points about the entire situation with one Ford wanting to drop out, the other wanting to stay but, being ill while another, tries to enter the Toronto Municipal political ring. The Ford Family is well known for being extremely wealthy. They are no slouches when it comes to business nor, money. None of them are going without anything and have a lot of people and resources at their fingertips. Money is not an object for either of these men nor, are jobs. So, why is it that the brothers and family are so intent on getting a strong-hold on Toronto in the municipal political arena? Doug Ford, by far, has much less experience in Toronto politics than his brother, Rob Ford. With only 4 years under his belt, by comparison to his brother’s 13 or more years, Doug has the disadvantage. However, it is said that a vote for Doug is a vote for Rob as one cannot separate the two brothers’ politics. Doug is simply the one with the least scandal under his belt and is thought to be less contemptable than his younger brother, Rob. However, while the Brothers Ford have claimed to have Toronto’s best interests at heart, a couple of things come to mind. Firstly, Rob lied to Torontonians and the world, repeatedly about his drug and alcohol usage as well as his affiliation with drug dealers and dealings. By mid last year, there was little that came out of Rob’s mouth that anyone could believe. He was later, stripped of his Mayoral duties and left with the title of “Mayor” in name only. Brother, Doug, backed Rob in all that he said and did, including the lies and, vehemently denied his brother had issues most of that time. Doug also fought with anyone who said anything against his brother’s wrong-doings to the point of making a buffoon out of himself as well when truths would eventually surface. Secondly, Doug had made it clear that he did not want to go back into the political ring and wanted out completely to enter the business world. This fact makes him an “unwilling participant” in the ring as he has stated that he is doing this because his brother “asked him to do it.” Not exactly the picture of someone who would have the best interests of one of Canada’s largest and most important cities in mind, is it? Driving that point home is the fact that Doug has stated that his real interests are in his brother’s well being. While natural, normal and expected by a brother who loves his younger brother, again it is showing that Doug’s heart is not in this race nor, does he seemingly have the drive or focus on being what the city needs most. It’s obvious to everyone now that Rob is going to need a lot of time to recuperate or, to have treatments if the tumor turns out to be malignant, which is looking more likely by the moment. Again, while everyone hopes and prays Rob will be ok and make it through this fine and healthfully, the reality is, no one knows yet and, with Rob being so ill, time and attention from Doug will naturally be devoted to his brother’s well being as well as that of his entire family. How does one run an extremely large and difficult city’s politics and business when his mind, heart and soul aren’t into that role? Both brothers have also stated that Toronto is where they want their focus to be but, with one sick and likely unable to do his job as even a city councilor for quite sometime to come and the other brother, worried about his brother’s well-being and perhaps, life…it is not likely that either of them will be able to fulfill either role successfully nor, with the amount of dedication it takes to do those jobs. How fair is that to the city or themselves? It appears more self-serving than anything else. With their nephew, also now entering the Toronto political ring, it seems that the Fords are simply out for a monopoly in Toronto City Hall for their own agendas rather than what is best for the city, itself. From my little corner of life, I think it would be best for all concerned, if both Rob and Doug were to sit this one out and wait to see what happens. However, the saga continues with the focus still on the Ford Family’s business rather than on city politics. If nothing else can be said about the Ford Family brothers, it’s that they know how to draw attention to themselves and, that may be the shame for Torontonians in this Ford Circus.